Review Summary: Not funny. Mostly comical. 1920 doesn't deserve a trip to the cinema. This one's just for gags. Overall, don't bother travelling back in time and give 1920 London a skip. Sharman Joshi starrer is the funniest horror film ever! Then again I find happiness anywhere. So be your own judge won't you. 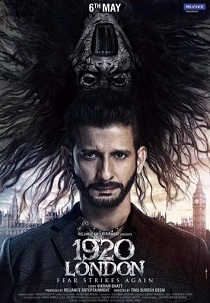 Overall, don’t bother travelling back in time and give “1920 London” a skip. Fails To Scare You Out Of Your Wits! Chopra is the weakest of the lot and she is obviously struggling to emote. Vishal Karwal has tried to stay true to his character but he doesn’t have much screen time. Several scenes are left incomplete, like when the possessed body leaves the hospital walking on its hands, how do they take it home in a normal condition. You can definitely give this Meera Chopra – Sharman Joshi horror drama a miss! Sharman Joshi and Meera Chopra’s horror flick is anything but scary!